When the Queen Mary ploughs her majestic way across the Atlantic on her maiden voyage next May, the ship herself will "tell" the story of the trip. The B. B. C. have made elaborate arrangements for broadcasts from the vessel from the moment she sails from Southampton until she greets New York for the first time. Then during the voyage we will be able to listen to a detailed description picture of day-by-day life on board. Mr. R. H. Eckersley, Assistant Controller of Programmes, will supervise all the broadcasts, Mr. John Snagge and Mr. R. H. Wood will be in charge of the technical side, and Mr. John Watt will produce. They, with about six assistants, will sail in the ship. On each night of the voyage a "flash" from the ship will be included in the news bulletins. The biggest broadcast of all is planned for the second night out. It will last for three-quarters of an hour and will take the form of a tour of the ship. Forty points of the ship are being wired for microphones. 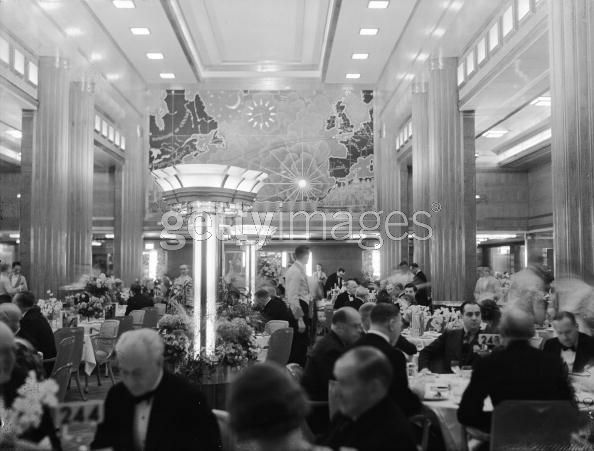 And then...the throb of the giant engines...the chatter and laughter from the dining-rooms...the dance bands on the sun deck and in the ballroom...the quiet tones of the men in the crow's nest...the surge of the Atlantic.